Officials hope the new regions will mean programs and services designed for and staffed by Inuit. The federal Department of Fisheries and Oceans, along with the Canadian Coast Guard, will soon form their own Arctic administrative regions. 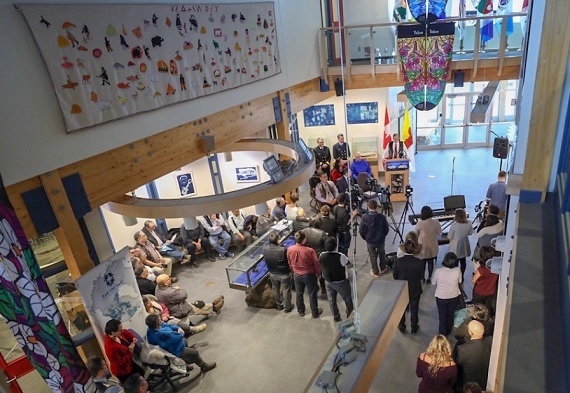 Fisheries and Oceans Minister Jonathan Wilkinson announced the new administrative regions at a news conference at Nunavut’s legislative building in Iqaluit on Wednesday, Oct. 24. Wilkinson said the new standalone Arctic regions would translate into more Inuit-designed and Inuit-staffed programs and services, as well as better capacity for search and rescue across the North. Fisheries and Oceans Canada currently has six administrative regions across the country, three of which cover the different Inuit regions: Newfoundland and Labrador (Nunatsiavut), Quebec (Nunavik) and Central and Arctic (Nunavut and Northwest Territories). “Unity is a key piece in this announcement, because this new department will be inclusive of all Inuit Nunangat regions,” said Inuit Tapiriit Kanatami President Natan Obed at the news conference. The new Arctic region will be led by its new Rankin Inlet–based director, Gabriel Nirlungayuk, formerly a wildlife director at Nunavut Tunngavik Inc. and deputy minister for the Government of Nunavut’s Department of Environment. “I am proud to be Inuk and I’m pleased we are creating this new Arctic region to be closer to the people in the North,” Nirlungayuk said in a news release. For its part, the Coast Guard will grow from three to four operational regions once the standalone Arctic region is established, headed by its new assistant commissioner, Neil O’Rourke, who will be based in Yellowknife. The organization has already made recent inroads in the Arctic with the growth of its auxiliary Coast Guard network of marine rescue volunteers in communities across the North, along with the addition of its new inshore boat rescue station which opened in Rankin Inlet this past summer. Just how the Coast Guard’s new Arctic region will build the capacity of search and rescue services in the North remains to be seen. Wilkinson said there will be more jobs and investments to come as the new offices are put in place.